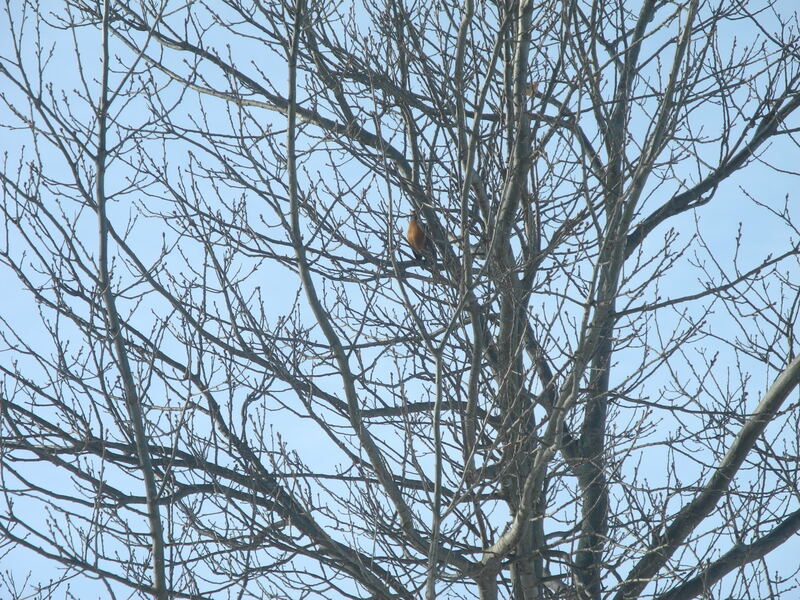 American Robin perches itself high in the tree behind the Interpretive Center. The warm weather has the snowing running away and the birds back out to play! This latest wave of warmer temperatures has many people excited for the possibility of spring. With the current seven-day forecast, it may just look like spring is well on its way as temps stay between the mid-30s to 40s all week. 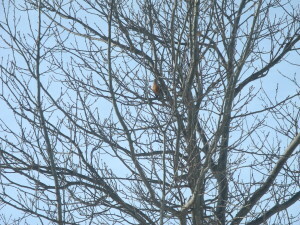 Another hopeful sign is the return of Robins. The American Robin is known for the coming of spring, because we don’t usually see them all winter until it begins warming up. Interestingly though, many Robins stay in their breeding range year-round, spending much of the time in their nests among the trees much out of sight from many humans, rather than trotting around lawns looking for Earth-Worms where we more typically see them. The number of Robins found in the more northern parts of the North American Continent, like Canada and Alaska, does vary because many Robins will migrate as far south as the southwest United States and Gulf of Mexico to escape the more frigid temperatures. I am sure I’m not alone when I say I look forward to going outside and enjoying this beautiful weather, and listening to the cheery song of the American Robin.